I've never seen such maturity coupled with such youth. On the occasions when I've spoken to him, I've been very impressed with the planning that goes into his routine, his confidence, his psychological outlook on lifting, his reverence for strength is enormous. When he talks with someone who has broken a world record, or come close, his tone of voice involuntarily changes, and no matter how modest the speaker may be Chip will delve into his achievement, celebrate it though conversation. All the while you can imagine the thought running through Chip's mind: "I will do the same thing, and more." His sophisticated approach to lifting, his determination, holds promise for a tremendous future in the sport. 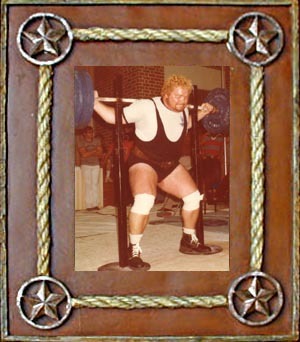 "Paul Barbee started me in powerlifting. Just like Rick Gaugler. I believe the key to my fast improvement to date was being taught the fundamentals of form and training at such an early age (13). Although our training routines differ for he individual needs of our bodies, Rick and I have almost identical lifting philosophies, and that's due to Barbee's influences six years ago. Quick workouts, light supplementary work, bodyweight down at 202. Longer workouts, heavy supplementary work, heavier bodyweight at 208. Quicker workouts again, little supplementary work, bodyweight at 204. 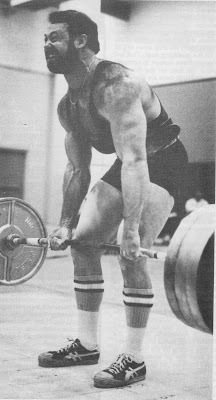 On my powerlifts, in general, the farther from the meet the more reps I do. Approaching the meet, I cut down the reps. I have had very little success with training them heavy. I would either peak too soon,go stale, or get injured. The heaviest I go in the SQ and DL is 4 reps, and in the BP 2 reps. I purposely try to undertrain the powerlifts just a little, and then make up for it with supplementary work. The muscles still get worked, but your mind stays fresh. Also, training at 90% and never getting hurt gives better overall results than training 110% and getting hurt twice a year. The strategy of my routine changes every meet, so I don't have a consistent training routine as far as sets and reps go. I do have a guideline for each workout though, depending on which stage of the cycle I'm in. It's like writing a term paper. You make an outline (cycle training system), write the words as you go (actual routine), an then get graded when you're through (the meet). I would set one of the preceding as a workout goal (probably a 4, 3, or double). If I doubled 385 I would know I could do 400 for a single. If I wanted a 410 BP the next meet I would pick something instead of a double as a workout goal. The idea is VARIATION. Don't always plan your strength off the same reps. Your mind will lose its enthusiasm after and while and it won't be a true gauge of your strength anymore. Also, by knowing your max strength off of ALL the rep ranges, you don't have to max in a workout to prove your strength . . . train lighter and save it for the meet. Seriously, it's hard to pick the five best, there's so many outstanding people powerlifting now. I used to boast a lot about my goals, etc. I've stopped that, as the year that I boasted the most I bombed out 3 out of 4 times, and this year I kept quiet and did well . . . superstition, I guess. My goals have shifted from poundage goals to titles and records. I enjoy competing one-on-one immensely. My goals for the future are to win the meets I enter and break people's records . . . not numbers.